Great photo more colour than our Sandpipers in Australia at the moment. Great shot! 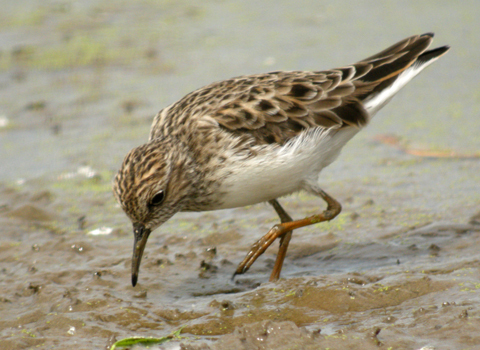 I look forward to our sandpipers returning in the spring. Cute little bird. I didn’t realize how small they really were until I saw one next to a greater yellow-legs. Great picture. Thanks. This bird does look big when it’s out of context. I’m enjoying the shorebirds for photography. Much more cooperative, at least, those that aren’t scurrying around in a frenzy. Beautiful photo. He is deep in the mud! And he was enjoying every minute of it! This pic shows the wing buried in flank feathers - which are not often this apparent and sometimes far more apparent - good ID.